Effetre Pine Tree Green Alabastro (EFF344) is a dark green semi-opaque glass. For an Alabastro, it is fairly well-behaved, but my rods were still a bit shocky and you really do need to be careful in order not to boil this colour, so work it cool. This is a very beautiful colour of green if you can work it without boiling it. Pine Tree Green Alabastro does not change colour when you reduce it. Here, you can see that when silver leaf is used on top of Pine Tree Green Alabastro, it disperses across the surface pretty widely and beads up into tiny grains of silver on top of it. When the silver is reduced and encased, it forms a more uniform greyish coating. This colour is a good base for silver glass. I got great colour in both of my tests compared to a lot of other glass colours. 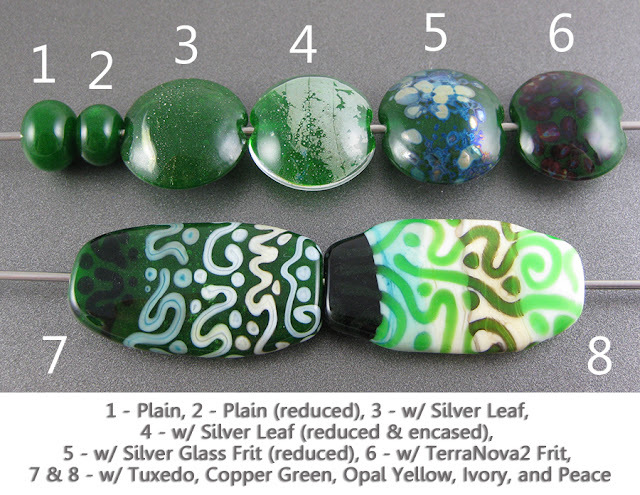 Here, in the rightmost bead, you can see how luminously transparent and pretty this colour is when used in thin layers over Opal Yellow and White. On top of Pine Tree Green Alabastro, Copper Green, Opal Yellow, Ivory, and Peace all separate. On top of Ivory, you can see a dark line developed around the Pine Tree Green Alabastro, and you can also see through it that the darkening also happens underneath the green. Curiously, there is no dark line reaction when the Ivory is on top. 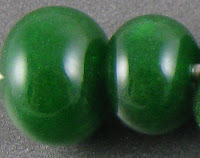 I don't have any other beads to share using this colour. I didn't feel inspired to do more with it after I made these test beads so I sold it. I'll be back to update this with pictures of what I make if I ever buy more.